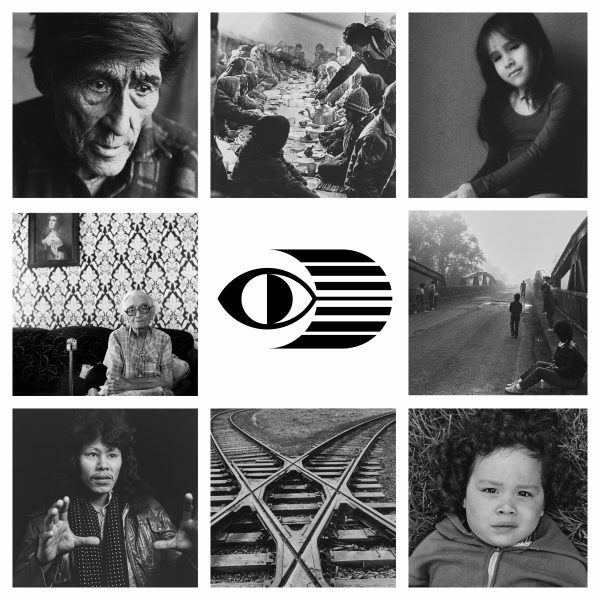 Image: Photograph details (clockwise from top left) Murray McKenzie, Native Studies, 1984; Dorothy Chocolate, Feast, Fort Franklin, N.W.T., 1981; Shelley Niro, Sisters, c. 1987; Brenda Mitten, Remember the Removal; Richard W. Hill (Sr.), Randy Hill; Joel Johnson, Rail Robot; Martin Akwiranoron Loft, Jessie – Micmac; Greg Staats, Mary, 1982. In 1985, a group of Indigenous image-makers came together to establish the Native Indian/Inuit Photographers’ Association (NIIPA) shortly after the first-ever Conference of Native Indian Photography in Canada held between March 8th to 10th in Hamilton, organized with support from the Photographers’ Union, the Native Women’s Centre, and the Hamilton Regional Indian Friendship Centre. From this gathering emerged a sense of both excitement and urgency with regard to the need for an Indigenous-led organization that would advocate for the support and training of Indigenous photographers, and promote a positive, realistic, and contemporary image of Indigenous peoples through the medium of photography. They felt that, for far too long, Indigenous peoples had been portrayed through someone else’s lens, and that it was time they took control of their image in order to contest and demystify stereotypical representations of Indigenous peoples. Operating as a non-profit, national, artist-run centre led by co-founders / co-directors Yvonne Maracle and Brenda Mitten, NIIPA offered technical training and networking opportunities to its members at a time when there were few, if any, supports available to Indigenous image-makers. Few institutions were actively collecting or exhibiting photography as contemporary art during the 1980s, much less photography by Indigenous artists. Notably, NIIPA’s annual conferences filled a much-needed gap by bringing Indigenous photographers together to exhibit their work, share ideas and knowledge, and support each other’s art practice. #nofilterneeded brings together, for the first time in over thirty years, photographic works by nineteen NIIPA members from the organization’s first two self-produced touring exhibitions, Visions (’85) and Silver Drum (’86), alongside additional photographs sourced from personal and public archives. While these two exhibitions largely featured NIIPA’s Canadian members, NIIPA’s membership also included Indigenous image-makers from the United States, including, but not limited to Pena Bonita, Shan Goshorn, Victor Masayesva, and Larry McNeil, demonstrating the organization’s acknowledgement of Indigenous sovereignty and resistance to the imposition of colonial borders. Covering a wide range of artistic approaches, techniques, and subject matter, the photographs presented in this exhibition provide an unfiltered view into the interests and concerns of beautiful, resilient, and thriving peoples. NIIPA’s founding demonstrates that Indigenous artists are equally adept at adapting to and making use of new technologies to advance Indigenous ways of seeing the world. While #nofilterneeded only presents photographic works created during the early years of NIIPA’s organizational history by the members who helped birth it, NIIPA continued to operate, albeit with an expanded mandate and membership, until 2005/6. #nofilterneeded shines much-needed light on NIIPA and its oft-overlooked importance to Indigenous art history by acknowledging the artistic achievements of its early members.